Last week I showed you an interesting shirt that could keep you nice and cool while driving in your car. It wasn’t exactly practical for anyone aside from professional racers, so I thought I’d share this vest which is a little more practical, though it will still likely only be used by athletes. 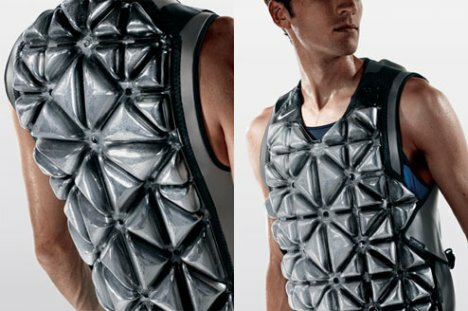 This strange vest is designed for athletes who want to get the most performance out of their bodies as humanly possible. One way that energy is lost is by keeping your body cool. This vest features an inner layer filled with ice, and an outer layer coated with aluminum. It will instantly turn you from average athlete into a superhuman, or at least into an insulated cooler. Supposedly if you wear this around for an hour before going out onto the field, you’ll find your endurance is increased by up to 21%. Even if you don’t last longer during competition, you’ll be nice and cool going into it.